You probably have heard the name of Billy the Kid, but have you heard the story behind his fame? Did you know a woman was involved? William Bonney, better known as Billy the Kid, was a leading participant in a prolonged shoot-out in Lincoln, NM during the late 1870s. The violent episode became known as the Lincoln County War. While many people know something of this story, few realize that a woman was at the center of it. She wasn’t Billy’s wife, mother, or sister, yet Billy and his band of “Regulators” were in her house during the conflict. Who was she, and why was Billy the Kid in her home? The woman was Susan McSween, the wife of attorney Alexander McSween. 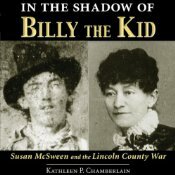 Author Kathleen P. Chamberlain conducted extensive research and wrote a fascinating account of Susan McSween’s life in her book In The Shadow of Billy the Kid: Susan McSween and the Lincoln County War, which was published earlier this year. You never hear about women when learning about the Wild Wild West. As one who loves to read biographies and learn about history, it was exciting to me to read this well-researched biography of a woman embedded in what is typically man’s story. Billy the Kid may have made Susan McSween famous, but she went on to become the Cattle Queen of New Mexico. I recorded the 12-hour audiobook for University Press Audiobooks and am honored to bring her story to audio. In doing so, I also conducted extensive research in order to pronounce the Spanish and Native American words found in the text. The audiobook is now available for immediate purchase and download on Audible.com at this link.